The year was 1973 when I stopped in at a local Musicland store and bought my first Hohner Blues Harp for $3.99. Like many 17 year olds, I was attracted to the wailing sound of the diatonic harp in the current popular music. Although I had no previous musical background, I was determined to figure it out and get the sounds I was hearing. I assumed that the Blues Harp model would magically produce what I wanted. It didn’t take long for me to realize this was going to take some work. An oft-repeated story, but for me I had cracked open a door to a world unimaginable to that 17-year-old kid, to something that would change the course of my life forever. At first I was completely in the dark — a rank beginner with no idea of how to proceed. Looking back at those earlier times, I am intimately aware of the frustrations inherent in being a self-taught musician. I am quick to point out to my students the dangers involved in learning an instrument this way. There were many things I would have to relearn later, and the only reason I play today is out of sheer determination. The last thing you want to do is have to break ingrained bad habits. This has become a guiding principle in my teaching — to give people the proper foundation techniques to build on from the beginning. In my first band, I met someone who would greatly expand my musical horizons. We were doing some tunes that were frustrating on the diatonic harp. I couldn’t follow the progressions. He suggested that I start playing the chromatic. He sat me down at the piano and started to teach me all the basic scales. I vowed that I would learn to play well in all 12 keys. This goal has been a driving force that has stayed with me. To play fluently and intuitively in each key for improvising, is essential. At the same time, one must recognize the inherent strengths and weaknesses of different keys. Like many other musicians, the great jazz horn players have inspired me. With them, it’s simply a “given” to have mastered all keys, modes and arpeggios. This friend of mine also introduced me to new musical worlds. He played jazz and classical records for me, and encouraged me to be open to all kinds of musical experiences. With my blues background and interest in improvising, I naturally gravitated toward jazz. At the same time all this was going on, I was studying for my degree in the visual arts, and absorbing the philosophies and principles of modernist art. The stress was on individuality, innovation, and experimentation. Although it was important to study the works, traditions and schools of the past, you were taught to forge your own artistic vision and statement. This had a great impact on me as a musician as well. I’ve spent many years trying to synthesize all the diverse musical influences I’ve experienced, to create my own voice as an instrumentalist and writer. In part, my new CD, Dream of the Serpent Dog, represents an effort in that direction. After graduating from college, I decided that music was my main muse. I began to study in earnest. I learned the guitar, took music theory lessons, and practiced. While I was playing in blues and rock bar bands, I was studying out of jazz horn books (eventually I learned to play alto sax), started learning the “standards” and practiced along with Jamey Aebersold jam records. In 1980, I attended one of Cham-Ber Huang’s seminars at the Grand Teton Music Festival, at Jackson Hole, Wyoming. As I progressed, I began to teach the harmonica. This has become a source of great satisfaction for me, as well as being a steady economic resource. To impart knowledge, and assist in developing someone’s skill, can be very rewarding. I now teach at many places in the Minneapolis/St. Paul area, most notably at the West Bank School of Music, and in the applied music department of the Minneapolis Community and Technical College. I also hold beginning workshops throughout the area. The majority of my “market” for teaching is on the diatonic harp. It seems that almost everyone wants to play the blues harp today. I myself have never lost my love affair with it. I particularly enjoy playing tongue block Chicago style blues, the occasional fiddle tunes, and the pre-war diatonic blues/jazz styles. Actually, I am now in the process of transferring my chromatic skills to the diatonic by using overblows and overdraws. I am a big fan of the Howard Levy school of playing. Once again, I am involved in a process that will take years to master. There is one diatonic harp track on my new CD which I play in second flat position. At every opportunity I encourage my students to learn to play a full chord instrument, especially piano, and to learn the basics of the chromatic harmonica. I find it impossible to teach music theory to someone whose whole musical experience is on a diatonic instrument. I tell them it’s like trying to learn a card game with an incomplete deck of cards. Many of my students though, are not seeking to become professional musicians or even serious hobby players. It’s something they do for fun, and to relax with after a hard day at the office. I respect that. It was about 11 years ago that I decided it was time to step up my training as a musician. I wanted to go back to school for music. I knew it would be hard to find a program that would accept the chromatic harmonica as a main instrument of study. Eventually I found a program that allowed me to do this. In 1987 my wife and I moved to New York City where I was enrolled in the Parsons/New School jazz and Contemporary Music BFA program. While I attended school there, I began to study privately with Robert Bonfiglio. Although I love to listen to classical music, I am not a classical player. He understood this. I was interested to see if I could apply his techniques to jazz improvisation. Could corner switching work while you were improvising? At the same time, I was not an accomplished tongue block player, and he set about helping me develop my skills in that area. I learned lipping for note separation. I studied music like Donna Lee by Charlie Parker, and I planned out when to switch corners. I also, quite frankly, was not a good music reader. Robert helped me to work on my sight reading skills. I found it extremely difficult to improvise with the classical approach. It was hard for me to move from corner to corner and improvise freely. Perhaps if I had learned this way from the beginning, it would have been more intuitive. I experimented with this technique for a number of years, but eventually decided that for me, jazz improvisation on the chromatic was best done in the pucker style. True, it’s hard to break out of “linear one-direction runs,” and the tone isn’t as mellow. However, I rather like the trumpet like attack and clarity. The freedom with tongue articulation it allows is important. A tune like Coltrane’s “Mr. P.C.” for example, will sound cleaner and is much easier to handle at fast bop tempos. Admittedly, long interval leaps are a huge problem, but if you’re willing to practice enough, they can be done to a limited degree. But the biggest factor to me is that instead of concentrating on the technique of corner switching and when to do it, I am more completely focused on musical improvisation. 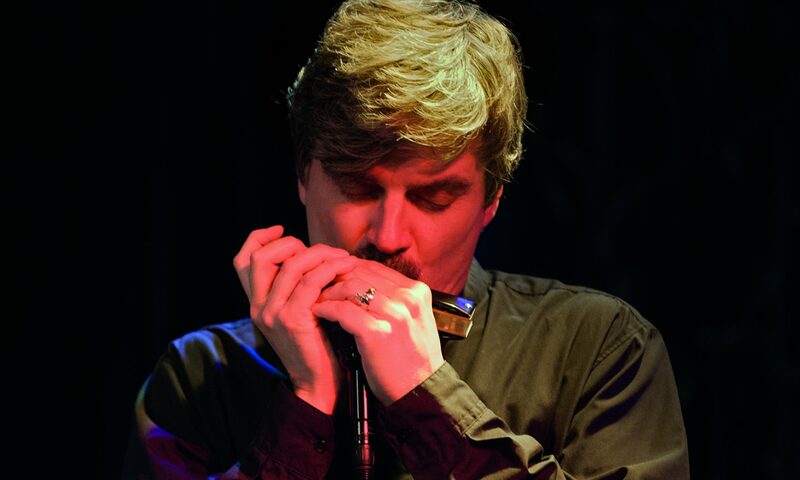 I must emphasize, that the conclusions I’ve reached in this matter reflect only my own personal experiences as a player, and these conclusions may not apply to other harmonica players. Nowadays I use tongue blocking on the chromatic for octaves, harmonies, and other effects that can only be achieved while tongue blocking. I apply single note tongue blocking mostly for the diatonic blues style playing, where the tongue slap is essential. After a year in New York City, we returned to Minnesota and the Twin Cities area. I was hungry to get back into the music business full time. My wife and I decided that we didn’t want to settle down and live in New York City. For a time, I was playing out at a furious pace with a broad range of musical groups. I led a rhythm and blues band that worked regularly. I played in an original rock/pop group that cut an album on an independent label. I started doing studio session work and various “jobbing” gigs. I was back teaching again; and, I formed a unique acoustic jazz band made up of a mandolin, banjo, acoustic guitar, and upright bass. I gained some very valuable musical insights with this group. I was becoming increasingly frustrated with the volume levels inherent in electric bands. This environment seemed to inhibit what I was capable of doing with the harmonica. However, playing with musical instruments which were all roughly in my own dynamic range, was a liberating experience. All the nuance and subtleties of the harmonica came out. I could play with much more fluency and control, rather than struggling to cut through a loud band. Even a jazz band with horns and a full drum kit seemed too much to deal with. It occurred to me that the harmonica was more naturally at home in a quiet environment, and that forcing it to compete, with instruments of a greater dynamic range, was pointless — even with amplification. Thus, I finally found my voice as a harmonica player. I abandoned loud bands and instruments altogether. Now, I love the intimacy of playing with just an acoustic guitar, and sometimes with an upright bass. On my new CD, “Dream of the Serpent Dog,” the 3 main players: Myself, an acoustic guitarist, and a bassist decided to record with a percussionist and not a full drum kit player. It was extremely important to us to preserve the relaxed interplay, subtle dynamics and overall intimate atmosphere we had created as a trio. My own plans for the future include another CD project with Bobby E., the guitarist from the “Dream of the Serpent Dog” CD. This project will be a duo effort as writers and players—just jazz fingerstyle guitar and harmonica. I plan on featuring more diatonic playing on this recording. I also have plans for a future harmonica instruction book, which will reflect my experience teaching the harmonica for the past 16 years.